Adele Raps Nicki Minaj’s Monster Verse: Must Watch! The karaoke car ride we have all been waiting for has finally been bestowed upon us! 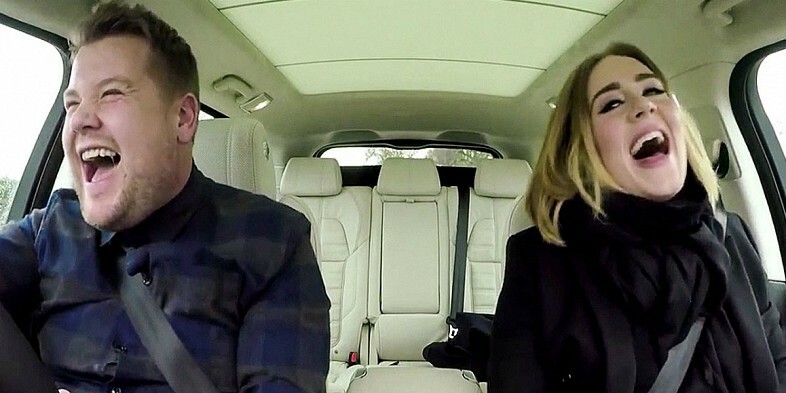 Adele recently took a car ride with fellow Brit James Corden and flexed her rapping skills. Corden is known for bringing the biggest names in music like Justin Bieber and One Direction along for a ride to belt out tunes in his car. Corden opens the skit with a parody of Adele’s lyrics to ‘Hello’ before they start to duet the song and she utterly is blown away by his spontaneous harmonies. The pair are an absolute riot together as the joke about Adele getting drunk during the holidays and jam out to the Spice Girls. Adele has gone on the record to say she is a huge fan of Beyoncé and if she could collaborate with anyone it would be Drake, but we didn’t know she was a huge Nicki Minaj fan. Last year marked the five year anniversary for Minaj’s famous verse from the song ‘Monster’ that featured Kanye West and Jay-Z. The ‘When We Were Young’ singer definitely channeled her inner Minaj, giving us facials, attitude and her signature finger wag.